Hey beauty lovers! Start the day with a big smile and a protein, good Omega 3 fat & chlorophyll rich breakfast! 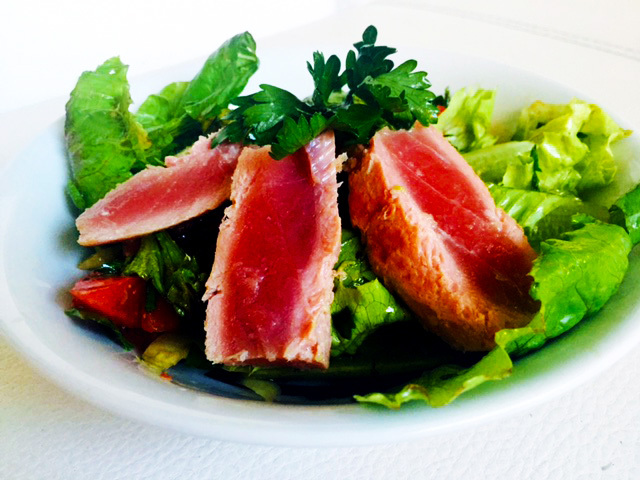 Seared tuna salad is super easy to make in 7 mins (recipe below) and sets your skin, endocrine system (hormones) and energy levels up for the day. - According to the American Journal of Clinical Nutrition, people who eat a high-protein breakfast feel fuller and more satisfied throughout the day, they snack less and above all eat significantly less junk food. - This could be linked to the fact that a high-protein meal reduces the production of the appetite hormone Ghrelin, which stimulates hunger. - Another study found that people who eat breakfast, and in particular a high-protein breakfast, consume fewer calories throughout the day. - Including abundant healthy fat (fatty fish, grassfed livestock, organic eggs, coconut oil, avocados, raw nuts) with breakfast kickstarts your hormones, as hormones are transported around our body by cholesterol, best made from animal fat. - As hormones (testosterone, cortisol, thyroid serotonin etc) regulate every single body function, keeping them at optimum levels is simply good sense - and is a very effective method to help stay young & gorgeous. Heat a Tbls of coconut oil in a pan over a high heat and add the tuna steak. Sear for 1 minute on each side leaving the inside raw. Salt abundantly on both sides while searing. Then pull pan off heat and add 1/2 of the chopped onion & a Tbls of capers with juice, leave to absorb. Mix chopped parsley, salad, sliced baby tonatoes and remainder of chopped onion in a bowl and season with olive oil, balsamico vinegar, salt & pepper. Divide onto 2 plates. Remove tuna from pan and slice into 1cm wide slices on a chopping board. Then arrange over salad, spoon over remaining onion & caper mix and add a squeeze of fresh lime. For extra sustenance, add a handful of mixed raw nuts or sprinkle with a Tbls of sesame seeds. 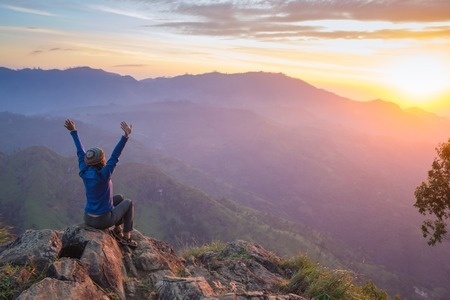 Global Wellness Day takes place Saturday, 11 June, and celebrations are happening in more than 4000 establishments and 100 countries, offering free “feel good” workshops and animations to reach more than 250 million people. Here is a look at some of the great ways people are celebrating wellness around the world. In Monaco STARSNBARS has joined Global Wellness Day Ambassador Nicholas Khan and more than a dozen local volunteers to offer a full day’s program of dance, massage, Pilates, laughter therapy, nutrition advice, kid's yoga, meditation, stress management, hypnosis, reiki and mindfulness. For more information, see STARSNBARS Facebook page. Activities across Spain include Dive Zen (yoga and meditation underwater) in the Canary Islands, swing dance on the streets of Zaragoza, meditation inside an old mine, a hike in the Pyrenees with wine and oil tasting, free massages at the airport in Madrid, kids yoga and more. The birthplace of Global Wellness Day, Turkey will be celebrating the event in Istanbul, as 10,000 people are expected to gather in KüçükÇiftlik Park for events including wellness and nutrition experts, breathing therapies, yoga, pilates, sports activities and zumba, as well as a section for children including dance, sports and recreational activities. In Sokolniki Park in Moscow, up to 50,000 people are expected to take place in group activities including aerobics, taebo, gymnastics, yoga, Zumba, healing dances and more. The event will also see open massage classes and treatments, counseling for young mothers, lectures on healthy eating, bath rituals and the psychology of wellbeing. A jogging race for mothers with kids and a bicycle race round out the activities. With the support of the ministry of public health, Lebanon is celebrating at the Edde Sands Hotel & Wellness Resort in Jbeil. 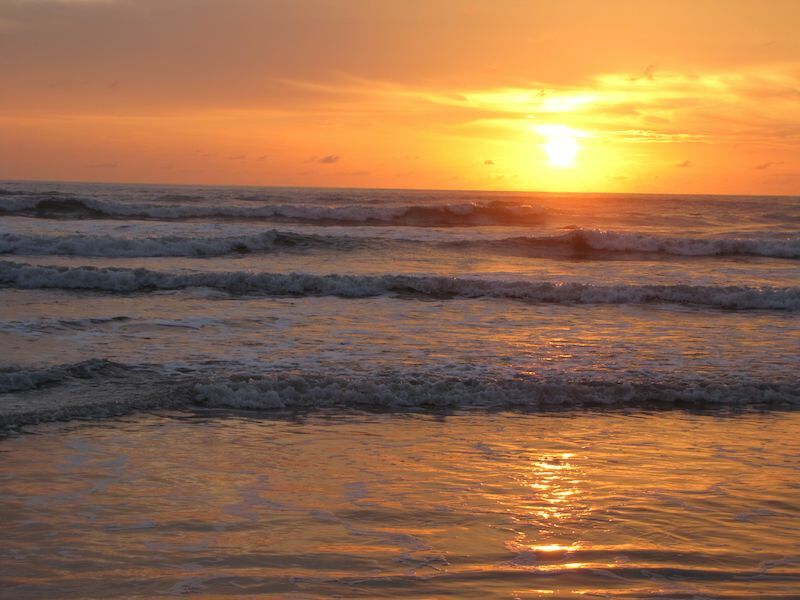 Activities include Zumba, aqua gym, acro yoga, and sunset walks on the beach, as well as express nutrition consultations, wellness for children, life coaching, a granola station and juice bar. In Amsterdam, the day will start with a live stream “Dance for Health” featuring the National Opera and Ballet of Amsterdam, and continue with inspirational speakers addressing topics such as consciousness, heart health and building a well world. Yoga, pilates, fitness and dance classes, as well as an agility ladder, pranic healing therapy, on-site massage and shiatsu, and advice from nutritionists. Free Les Mills classes, rock-climbing trials, a beach volleyball tournament, “Trail of the Dolphins” hiking tour and sundown yoga. This is the first year Saudi Arabia is taking part in GWD, which coincides with the fasting month of Ramadan – itself billed as a manifest of wellness that allows the body to detoxify itself. In Jeddah, the mayor’s office is sponsoring one of the city’s biggest walkways and urging residents to jog during Ramadan for maximum strengthening while fasting. The initiative is targeting some of the area’s biggest social media influencers, with an expected reach of more than 700,000 people. In Singapore, fitness workshops, wellness talks and children’s workshops will take place on 11 June, with a particularly impressive lineup of activities for kids, including yoga-nastics, Bollywood and jazz dance, mindfulness meditations, clay bank making, and story time. In Dubai, the Shangri-La hotel is celebrating by offering free yoga sessions, special spa offerings and a day of pampering for the children of the UAE Down Syndrome Association. Children will learn from experienced therapists how to mix their own homemade body and facial products, using natural ingredients like chocolate, strawberries and oranges, and they’ll also enjoy mini-facials and hand and foot scrubs. Children and their families will also enjoy food from the hotel’s Rooted In Nature menu, which features organic ingredients. In Caen, Normandy, Le Grande Run (The Big Run) will take place over the weekend, and will include a marathon, 10k and 20k, as well as an exhibition hall with lots of sports federations encouraging people to be more active. Attendance is expected to be in the thousands. 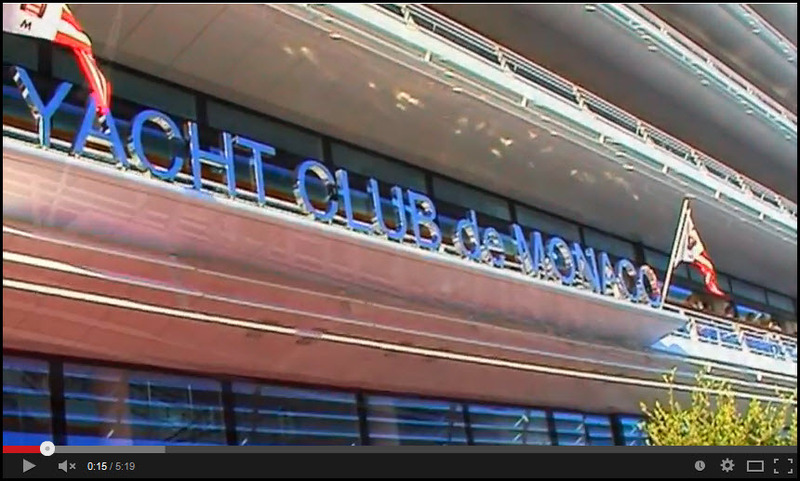 In Royan, 420 people will run a 42km relay marathon, with each person running 100 metres. And CIDESCO school Ecole Privee d’esthetique will open its doors for the public to benefit from free massages performed by students. In Dzintari Mezapark, Jurmula, a GWD celebration will include yoga, TRX, body art, dance, aqua bike, massage, meditation, wellness diagnostics, activities and entertainment for children and a concert performance by Nataly Tumsevica. The President of Cyprus, Nicos Anastasiades, has become the first president to officially support Global Wellness Day, and a day-long celebration will take place in Limassol, which will include 2.5 hours of Les Mills classes, followed by a concert from The Coop Band. At Sedona Golf Resort in Arizona, an integrative fitness and wellness golf tournament combines activities such as tai chi, yoga, kettlebells, mountain biking and zumba throughout the resort’s famed golf course. In Florida, the Miami Institute for Age Management and Intervention will bring guest speaker Dr Adonis Maiquez to the Ritz-Carlton Key Biscayne to speak about anti-ageing tips, followed by an hour-long cardio beach hike to the historic Cape Florida Lighthouse. In Texas, guests at the Four Seasons Hotel Austin will be invited to gather on the back lawn to partake in some informal pet therapy. For three hours, guests will frolic with puppies provided by the Austin Humane Society. A three-mile guided walk/run around Lady Bird Lake will also take place. VOTED TO GIVE THE MOST BEAUTIFUL TAN! Sun worshippers unite! The super-antioxidant in SKINERGIE - Astaxanthin, has been voted by several hundred students to give you the sexiest, most beautiful tan! A panel of students were asked to vote on the most attractive skin tone of a range of UV-protective supplements, and the warm, golden glow provided by Astaxanthin won hands down!! Already super-popular with endurance runners, iron-men and other top athletes, the antioxidant, anti-inflammatory and UV protective benefits of Astaxanthin are well documented. The algae that produces Astaxanthin only does so when its water supply dries up and the algae is exposed to bright sunlight: Haemacoccus Pluvialis is normally green and submerged. However when its water supply dwindles and it is exposed to direct sunshine, Haemacoccus Pluvialis produces its own, super-powerful 100% natural sunscreen, which allows the algae to survive out of the water and beneath harsh sunlight, in conditions where other algae just 'curl up and die'. The antioxidant power of Astaxanthin has been demonstrated to be 6000 times stronger than Vitamin C, 54 times more powerful than beta-carotene and able to to dramatically reduce the wrinkles and inflammation linked to UV-induced skin aging. Ideal for preparing your skin for Summer sunshine, Astaxanthin-rich also contains 2.5g of concentrated Omega 3 and collagen-boosting Acerola. A synergistic blend that protects skin from UV damage while still allowing you to absorb Vitamin D from the sun. Given that Vitamin D is essential for a healthy immune system, for strong bones and teeth and even for cancer protection - boosting natural Vitamin D3 levels through small, daily bursts of natural sunshine is one of the most effective ways of protecting your health. You can now buy SKINERGIE with 15% off. Just enter the code SBW15 at checkout! THE DEW MONACO EASTER BUNNY HAS ARRIVED! 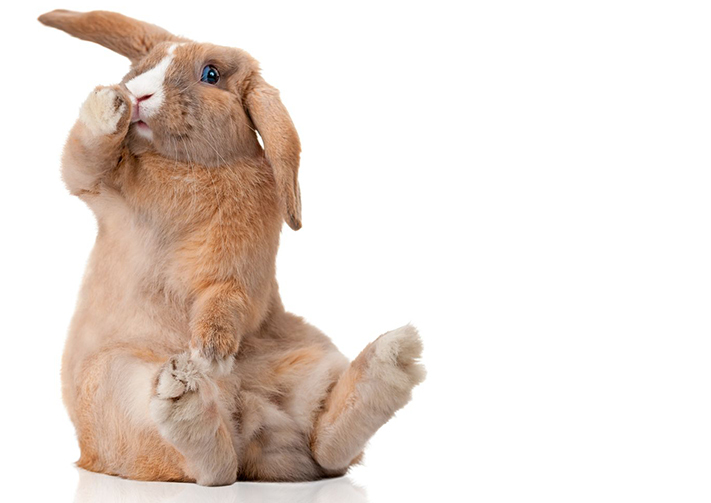 Receive an instant 20% off all orders on this website courtesy of our Easter Bunny. Just enter the code <bunny> at checkout. From all of us in Monaco, Have a Beautiful, INSIDEOUT HAPPY EASTER! Coupon valid until April 1st 2016. It is that time of the year again: one too many parties and skin, waistline and energy levels are all a little worse for wear. Pick yourself up and re-energize in style with deW BEAUTY SHOT soluble, high-antioxidant beauty drink. Rich in anti-inflammatory Curcumin, clarifying Raspberry, beneficial-gut-flora-boosting Baobab, firming Marine Collagen, antioxidant Maqui berry and energizing Matcha Green Tea, BEAUTY SHOT is popular with Monaco IT girls for its refreshsing, hangover-busting qualities: just dissolve 2 sachets in a glass of water and drink first thing in the morning; works a charm! Now on special offer: buy one get one FREE until Midnight CET on Monday January 4th 2016. FOUR AMAZING HEALTH BUDDIES IN YOUR KITCHEN CUPBOARD! Christmas is the time we all overindulge, so here are 4 simple kitchen spices with the amazing ability to help keep you svelte despite the feast! If (like us..) you are intending to splurge on chocolates, cookies and cakes over Christmas, Curcumin is your absolute best friend. 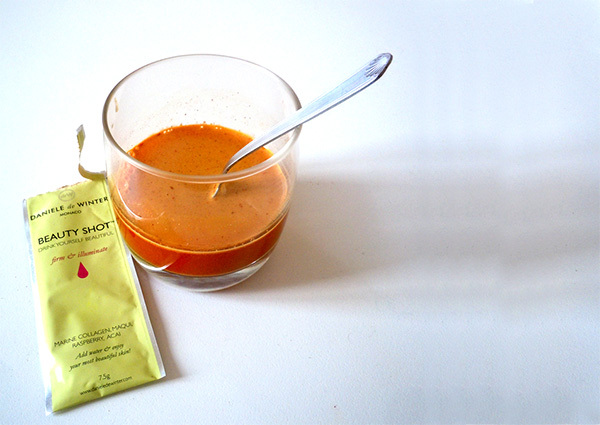 Just take 2 tsp / day (mix with black pepper & coconut oil and heat with food for best absorption) or mix 2 sachets of BEAUTY SHOT in a glass of water just before you tuck in (The curcumin in BEAUTY SHOT is already highly bioavailable so does not need heating/mixing with fat). PS. As an added bonus, Curcumin also helps keep skin clear and blemish-free, virtually no matter what you eat. Delicous in teas, cakes and hot chocolate, cinnamon is super-effective at stabilizing blood sugar levels and helping normalize type 2 diabetes. A meta-analysis of eight clinical studies on the effect of cinnamon intake on people with type 2 diabetes and/or prediabetes concluded that cinnamon is highly effective at lowering elevated fasting blood glucose levels and enhancing insulin sensitivity of cells. 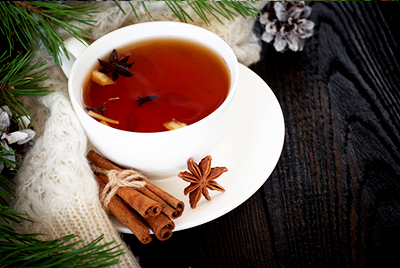 For healthy individuals, a cup of cinnamon tea with or after a meal actively works to balance blood sugar and thus reduce the risk of weight gain. PERFECT for washing down Christmas dinner!! Delicious, fragrant and super versatile, coconut oil has been shown in multiple clinical studies to boost metabolism, increase healthy HDL cholesterol levels and actively reduce fat around the waist. The medium chain triglycerides in coconut oil have also been shown in clinical studies to boost memory and brain function. Coconut oil can also help relieve an upset stomach, heal yeast infections, boost energy and muscular performance, reduce whole body inflammation and (when applied externally) protect skin from dehydration. Cold pressed, organic coconut oil is the best! Cloves are some of our favourite warming Winter spices. Long used by our grandmothers to relieve pain, toothache and infections, Latest clinical research now shows that cloves can do a whole lot lot more to support our wellbeing. Clinical trials at University of Minnesota, the University of Pittsburg and China's Capital Medical University each independently demonstrated that cloves have the ability to stop the growth of Cancer. In these trials, five types of cancer cells were exposed to cloves: Ovarian cancer, Breast cancer, Liver cancer, Colon cancer and Pancreatic cancer cells. All five responded favorably to whole clove extract, ie clove was able to halt both the activity and growth of the cancers while leaving healthy cell activity undisturbed. The clove extract halted the cancer cell activity in a dose-dependent manner: ie the more clove that was applied, the greater the observed anticancer effect. This is considered the gold-standard of determining whether a particular compound is causing a desired result. Pretty cool for a tiny dried flower..
deWMC: Love, love LOVE your beauty InsideOut! True INSIDE OUT Beauty is so much more than just beautiful skin, it is about revelling in this beautiful life and above all remembering how worthwhile, beautiful, unique and absolutely awesome you are! 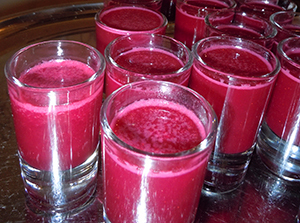 -super antioxidant to clear that hangover and make you feel AWESOME! Put all ingredients in a blender, blend together and serve in chilled shot glasses. YUMM! We are thrilled to announce that DANIELE de WINTER have been selected as Official Yachting Health and Beauty partner of the Monaco Yacht Show again in 2015. We had a fantastic conclusion to our DANIELE de WINTER waterfront spa at the Monte Carlo Yacht Show 2014 located in the stunning new Monaco Yacht Club : all deW treatments for the four days of the Show were booked by midday of day one, so we added a second treatment bed at 7am on day two to double capacity - and booked up again almost immediately -Wow ! A million thanks to our beautiful, professional, fantastic therapists from the Ecole Elegance Gontard in Nice: Alexandra, Genna, Priscilla, Anaïs, Alison, Adrienne, Dyane and Megane – all our guests absolutely raved about you! Kissing relieves stress and helps to dilate your blood vessels, which may help lower your blood pressure and reduce cholesterol levels. When you kiss, saliva production increases in your mouth, and this helps to wash away plaque on your teeth that may lead to cavities. This said, cavity-causing bacteria can also be transmitted via a kiss if the person you’re kissing has poor oral habits.. Kissing prompts your brain to release a happy elixir of feel-good chemicals like serotonin, dopamine, and oxytocin. This isn’t only important for your happiness, it also may also help to strengthen your relationship: people who kiss a lot report more satisfaction with their partner.